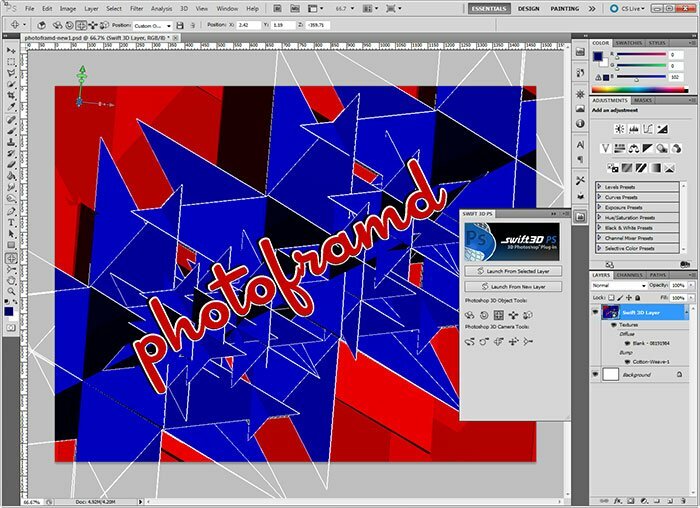 If you have played with Photoshop CS5 new Repousse tool, you probably have been frustrated by how difficult it is to use. Frankly, it is not a real 3D environment with real 3D tools. Thankfully, there is an alternate – Electronic Rain’s Swift3D PS. Basically, Electronic Rain took the entire Swift3D program (which is now in version 6) and crammed it into a Photoshop plugin. I was very excited to hear that they reworked the plugin for true 64-bit experience. After a bumpy start, the latest version is stable and works very well in Photoshop CS5 64-bit. Best yet, it is only $150! Must upgrade Photoshop CS5 to 12.01. This free update from Adobe fixes some of the Adobe bugs in the 3D environment. Install Swift 3D PS v1.0 Build 141 ( 7/13/10 ). This version is now stable and does not crash in 64-bit Photoshop CS5. It also does not slow down CS5 as the earlier version did. Reboot your computer after you install Swift3D PS (either trial or licensed version). Better safe than sorry. In Swift3D, only use one of the designated Views. I have been using Top view with great results. The custom views or even the Default view in Swift3D gets lost jumping in and out of Photoshop. The Top view sticks. You will need to zoom in to use either the Photoshop 3D tools or the Swift3D tools to adjust the view to match. You may also need to rotate the view. But, again, once changed, it sticks. While in Swift3D, be sure to Export your 3D model as a T3D file just in case BEFORE you jump back to Photoshop! These T3D file can also be imported directly to the stand-alone version of Swift3D 6. Unfortunately, there are still a few bugs. But, they can be worked with. At the right, is the 3D Materials palette in Photoshop CS5. Look at the colors assigned to Diffuse and Ambient. 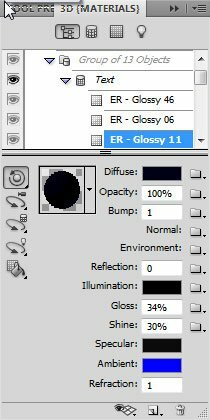 Jumping in and out of Photoshop eventually hits a bug which flips these two values. But, if you reset the value in Photoshop, it seems to stick. You may also see an issue with the Lights assigned by Photoshop and the lights in Swift3D. I have been deleting the Photoshop assigned lights while in Swift3D (they actually say “Photoshop Light”). Creating lights in Swift3D seems fine and carries well back to Photoshop. Other than that, Swift3D PS is very impressive. Swift3D is a very established program which has been THE 3D tool for Flash animations. Electronic Rain has plenty of examples and videos on their site showing the power of this program. Basically, you can use it to quickly extrude some text or vector line art. 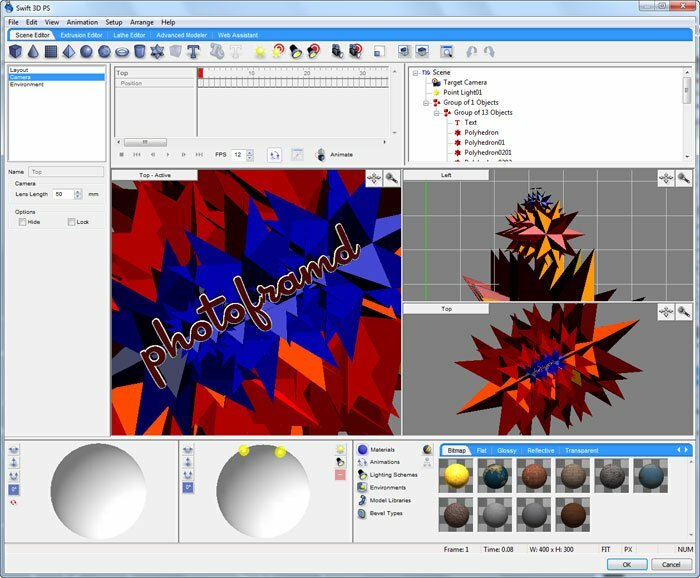 But, the more time you spend with it, the more you will appreciate the real 3D modeling tools which Photoshop CS5 lacks. There is a trail version on their site, so give it a try. I also have a 4-part tutorial on my blog for on how to use Swift3D with Photoshop CS4. It applies to the CS5 too.